Product code: ES6005 Categories: Sold Items, Sold Rings. 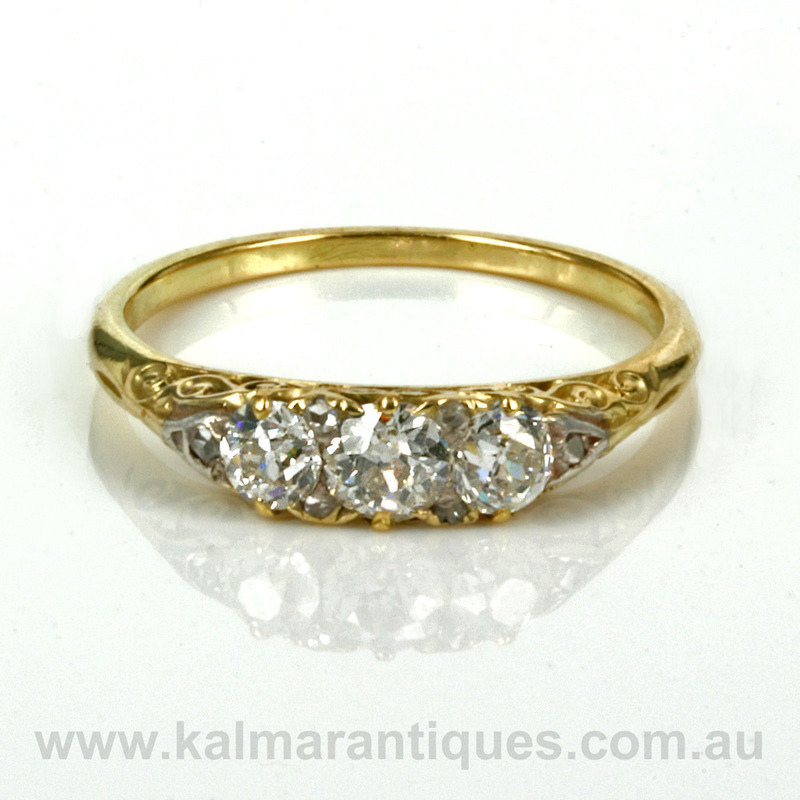 This is a wonderful antique diamond engagement ring that will surprise you when you realise that there are not just the three main diamonds but a further six more diamonds. Dating from the late Victorian era of the 1890’s the ring was hand made in 18ct gold and shows the most wonderful carved shoulders on each side. In the ring there are the three main European cut diamonds that total 0.86 carats and are G in colour and Vs to Si in clarity. And then between each diamond and on each end are a total of six rose cut diamonds to add not only extra sparkle but also that added charm and character so often seen in antique engagement rings of this era. These diamonds total 0.06 carats and really do go that extra step in making this such a character filled engagement ring. From one end where there is a smaller diamond across to the other side, this distance measures 12.5mm across by 4.6mm wide at the centre and feels so comfortable to wear exactly as an engagement ring should. 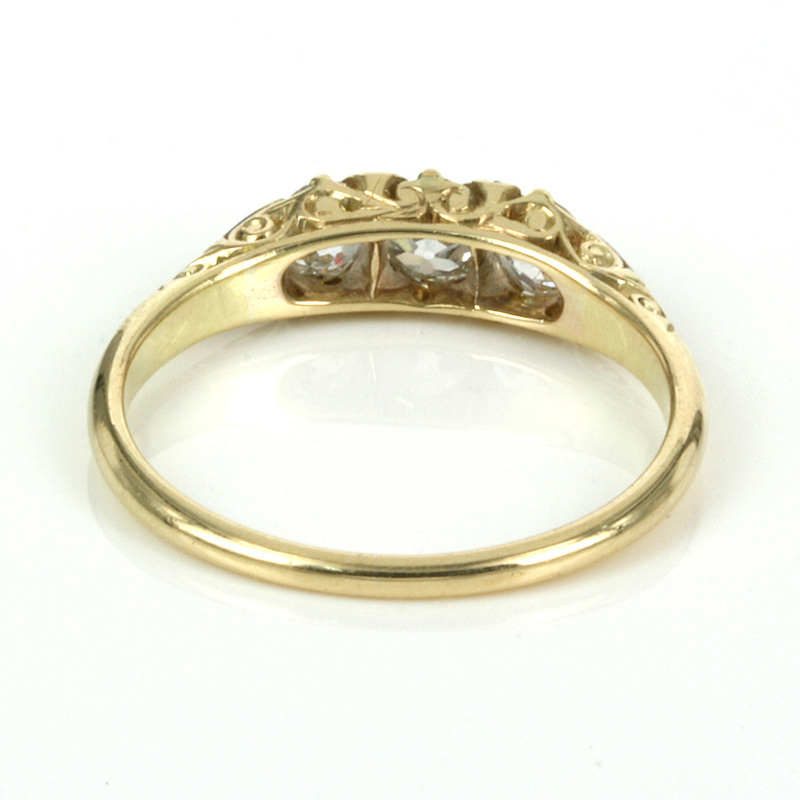 Antique diamond engagement rings always have that something special to them, and this one certainly has that and more.